– Currently, the branch offices are not managed by using the Configuration Manager deployment in the New York City office. – Currently, the activation of the client computers in the Pans office is performed manually. Currently, all new client computers are shipped initially to and imaged in the New York City office, and then shipped to the other offices. There are multiple images for both 32-bit and 64-bitcomputers. 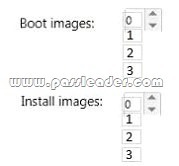 The images contain specific drivers for each type of computer. All of the computers are PXE-compatible. If a client computer must be reimaged, the reimaging is performed locally at each office by using a boot disk and a USB hard drive that contains multiple images. USB hard drives storing updated images are sent to each office every six months. A third-party desktop application named App1 is used by the sales department. All of the users in the human resources department use an application named HR1. HR1 is installed by using a Windows Installer (MSI) package. HR1 is compatible with Windows 7 only. – Users in the branch offices report that it can take up to four weeks to receive a requested new client computer, which is too long. – If a client computer must be reimaged, it can take several hours before the computer is ready for use again due to the updates that must be applied. – Currently, the hardware used for the client computers in the Paris office is undocumented. All of the computers in the customer service department and the research department were replaced during the past year. – A new line-of-business Windows Store app named App2 will be deployed. App2 will be used by all users. – New client computers will be delivered directly from the hardware vendor to each office. As a result, Proseware plans to change the imaging process. – Minimize the size of desktop images. – Centralize the activation of all the client computers. – Minimize the amount of network traffic over the VPN. – Minimize the number of desktop images that must be maintained. – Ensure that only the users in the human resources department can access HR1. – Ensure that the data of the research department users is retained while deploying the new image. – Minimize the amount of time it takes to upgrade the research department computers in the Paris office. – Ensure that a branch office administrator can deploy a new image to new client computers with minimal delay. – Ensure that the French language is configured as the default language for the client computers in the Paris office. – A network technician will visit each client computer in the Paris office to start the operating system deployments. – Gather a detailed hardware inventory of all the client computers in the Paris office without installing any additional software on the computers. – Users in the research and customer service departments in the Paris office will have the new image deployed to their current computer. The current Windows installation will not be preserved during the upgrade. – All of the other client computers in the Paris office will be replaced with new computers during the next two years. During this time, some computers may need to be reimaged by using the current Windows image. You need to recommend a solution for the research department computers in the Paris office. Which action should you include in the recommendation? You need to recommend a method to deploy the images to the new client computers in the Paris office. What should you include in the recommendation? You are evaluating deploying the new image to na.proseware.com in the branch offices by using Configuration Manager. You need to recommend changes to the existing environment to meet the technical requirements. What should you recommend deploying to each branch office? You need to recommend a solution to generate a report for the client computers in the Paris office. What should you include in the recommendation? You need to capture the SOE image. You deploy Windows 8.1 Enterprise and all of the required applications to a new client computer in the New York City office. What should you do next? You are planning for the deployment of the new SOE image to the Paris office computers. 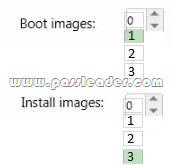 You need to identify the minimum number of boot and install images required to meet the technical requirements. What should you identify? To answer, select the appropriate number for each image type in the answer area. You need to identify the correct configuration pass to modify in an answer file for the client computers in the Paris office. Which configuration pass should you identify? You are planning the deployment of new applications for users in several departments. You have three user groups. The groups are shown in the following table. You need to identify the appropriate application delivery method for each department. Which application delivery methods should you identify? To answer, drag the appropriate application delivery methods to the correct departments. Each method may be used once, more than once, or not at all. You may need to drag the split bar between panes or scroll to view content. You plan to deploy a Windows 8.1 Enterprise image that contains a volume license version of Microsoft Office 2013. The image will be captured from a reference computer. Office is activated by using the Key Management Service (KMS). On the reference computer, you install Office 2013 and you verify that all of the Office applications start properly. You need to ensure that when the image is deployed, users are not prompted for activation when they first start an Office application. What is the best action to perform before you capture the image? More than one answer choice may achieve the goal. Select the BEST answer. Your company deploys Microsoft Office Professional 2013 and installs all of the Office 2013 Professional applications to 100 computers. You need to automate the removal of Access 2013 from some of the computers. What is the best approach to achieve the goal? More than one answer choice may achieve the goal. Select the BEST answer. A. Modify the Config.xml file, and then run msiexec.exe. B. Create an MSP file, and then run setup.exe. C. Modify the Config.xml file, and then run setup.exe. You use the Key Management Service (KMS) to activate Microsoft Office 2013. You need to trigger the activation of Office 2013 on a client computer. Which tool should you use? You need to identify the minimum number of Microsoft Application Virtualization (App-V) packages that must be created to ensure that App1 can run on all of the client computers on the network. How many App-V packages should you identify? Your network contains one Active Directory domain named contoso.com. The domain contains computers that have Microsoft Office 2007 and Office 2010 installed. You plan to upgrade all of the versions of Office to Office 365 ProPlus. You need to recommend a solution to identify which Office add-ins are in use. What is the best recommendation to achieve the goal? More than one answer choice may achieve the goal. Select the BEST answer. A. Install the Office Deployment Tool for Click-to-Run on all of the computers. Install the Microsoft Application Compatibility Toolkit (ACT) on one of the computers. B. Install the Telemetry Processor on all of the computers. Install the Telemetry Agent on one of the computers. C. Install the Telemetry Agent on all of the computers. Install the Telemetry Processor on one of the computers. D. Install the Microsoft Application Compatibility Toolkit (ACT) on all of the computers. Install the Office Deployment Tool for Click-to -Run on one of the computers. You have a deployment of Microsoft System Center 2012 R2 Configuration Manager. You plan to deploy a Click-to-Run installation of Microsoft Office 365 ProPlus. On a client computer named Computer1, you download the installation files by using the Office Deployment Tool for Click-to-Run. You need to deploy Office 365 ProPlus to all of the client computers as a Microsoft Application Visualization (App-V) package by using Configuration Manager. What is the best action to perform first? More than one answer choice may achieve the goal. Select the BEST answer. You have a server named Server1 that runs Windows Server 2012 R2. Server1 is a Windows Deployment Services (WDS) server. You add an x86 capture image named Image1 and an x64 capture image named Image2 to WDS on Server1. The network contains the client computers configured as shown in the following table. You need to identify which capture image can be used on each computer. What should you identify? To answer, select the appropriate images for each computer in the answer area. You have a Windows Deployment Services (WDS) server named WDS1. WDS1 is used to deploy an image of Windows 8.1 Pro named Image1 to the computers in a classroom. The computers are redeployed every day. WDS1 only contains one install image. Every morning on each computer, a technician must press F12, and then choose Image1. You need to automate the process of deploying Image1 to the computers. Image1 must be deployed automatically to the computers when they are turned on. Which two actions should you perform on WDS1? Each correct answer presents part of the solution. A. Configure a Multicast Transmission. B. Configure the Network settings. C. Configure the Boot settings. D. Configure the PXE Response settings. E. Configure the Client settings.